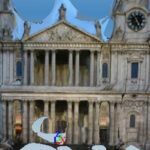 Workshop: Want to learn how to make 2D into 3D? Learn about this technique in a one hour workshop presented by Scott McAvoy from UC San Diego. Scott will walk you through the process, show you the software, and will give a demonstration of how photogrammetry works. He will be available for questions on your photogrammetry or 3D project after the workshop. This event is free and open to the Cal community. UCB ID required to enter Moffitt Library. The Library attempts to offer programs in accessible, barrier-free settings. If you think you may require disability-related accommodations, please contact: jean.ferguson@berkeley.edu, 510-768-7618. Please see bit.ly/dp-berk for details. One of the largest hurdles of using Google is the amount you must weed through. Some searches result in thousands of pages; who has time to go through all that? Did you know you can manipulate a regular Google search with a few hacks (such as adding site:url to limit to a specific url)? In this workshop we will cover many tips, tricks and strategies to make searching Google, Google Scholar, and all Google’s information products more productive. Citation management software can help organize research results and make writing papers easier by quickly creating properly formatted bibliographies and footnotes. Learn how to use this easy citation manager for Firefox, Safari and Chrome. The workshop will cover importing citations, exporting bibliographies, sharing resources for working groups, and using a wide variety of citation styles. The Advanced workshop is designed for those already using Zotero, who want to learn more about editing and organizing citations, using Zotero with a word processor, syncing data and attachments, and expanding Zotero’s functionality with plug-ins. 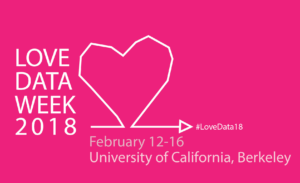 The University Library, Research IT, and Berkeley Institute for Data Science will host a series of events on February 12th-16th during the Love Data Week 2018. Love Data Week a nationwide campaign designed to raise awareness about data visualization, management, sharing, and preservation. Please join us to learn about multiple data services that the campus provides and discover options for managing and publishing your data. Graduate students, researchers, librarians and data specialists are invited to attend these events to gain hands-on experience, learn about resources, and engage in discussion around researchers’ data needs at different stages in their research process. Intro to Scopus APIs – Learn about working with APIs and how to use the Scopus APIs for text mining. Data stories and Visualization Panel – Learn how data is being used in creative and compelling ways to tell stories. Researchers across disciplines will talk about their successes and failures in dealing with data. Planning for & Publishing your Research Data – Learn why and how to manage and publish your research data as well as how to prepare a data management plan for your research project. No pre-registration is required; all are welcome. RefWorks is a citation manager that allows you to organize citations, import them from databases, store pdfs, and insert references and bibliographies into documents (MS Word and Google Docs). New RefWorks has a new look and feel from its previous iteration. This hands-on workshop will cover the basics of navigating the new interface, organizing your citation library, creating new citations, importing citations from various databases, inserting references and creating bibliographies in Google Docs and Microsoft Word. Please create a RefWorks account prior to class. If you already have a RefWorks account in the legacy RefWorks, you be shown how to migrate it to the New RefWorks platform. The Bioscience Library Training Room is equipped with PCs, but you are welcome to bring your laptop. Please, no food or drink in the Training Room. This Wednesday, September 21, I will be conducting a three-hour workshop on Zotero in the D-Lab (356 Barrows). This workshop is divided into three parts: 1) installing and setting up Zotero and a few other features; 2) learning the basics of Zotero; and 3) exploiting additional features of Zotero. When you register you will be registering for the entire workshop, but you can show up for only the parts that are of interest to you. You can register for the workshop here. This workshop is open to everyone. A laptop is required. If you want a briefer and less in-depth introduction to Zotero, my colleague David Eifler will be offering two Zotero workshops that same day, from 10-11 and 11-12 in 305 Wurster Hall. Registration is not required. Please let me know if you have any questions. dorner@berkeley.edu.